For our Christmas Competition, to mark the time of year that celebrates giving, we invited people to tell us about what they have been able to offer the horses that have come into their lives. We would like to take this month's newsletter as an opportunity to look back on our journey into holistic horsemanship, and sum up the gifts we have given our own horses as a result. All of us who love our horses want to do the best for them, and we try to give them what they need for a comfortable and happy life. The problem is that we tend to impose our own requirements and desires onto horses, forgetting that we are two very different species, with not only different needs, but also very different ways of expressing how we feel about our environment. We personally fell into this trap in many areas of how we looked after our horses in the past, and our holistic journey has been a process of realizing what horses really need for a happy and fulfilled life. Only then can we expect them to be ready to give back to us on a profound level. If horses were to make a wish-list, this would probably be near the top for most. Horses are, at the deepest root of their nature, herd animals, and a few hundred years of selective breeding cannot take this away from them. Their sense of security depends on having their place in a stable herd, where the hierarchy, however dynamic it may be, defines their boundaries and ensures social balance. 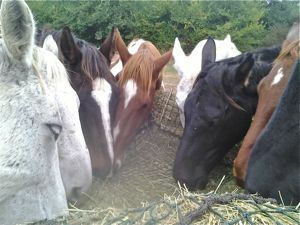 Living in a stable group gives horses the chance to develop many subtle relationships, some of which are close and enduring, others which evolve, but all are part of the horse's expression and development of their personality, allowing a personal development that simply doesn't happen when horses have limited interaction with other horses. We have always kept our horses in groups, but in the past we felt we needed to divide them up into smaller groups for various reasons. When we decided to put them all together, we realized how much better this was for them, as each horse then had so much more opportunity to find their own place that fits in with who they are, and to make the friends and partnerships that were right for them. Over time, a stable but complex hierarchy has formed in both of our herds, giving a sense of security to every horse. We have two separate herds due to Rafael, a rescued horse who turned out to be a rig, and who can therefore only live with mares. This situation has actually allowed several mares, who were somewhat outsiders in the main herd (a mixture of mares and geldings), to find their place in Rafael's band, and to start to express their characters and develop their self-confidence. Offering our horses the gift of the herd came about as a result of us undoing our limitations about horses being together in a large group, and our ability to manage them in this situation. Read more about the herd here: Horse Herd Behavior. Horses are animals who have evolved to be constantly on the move - in order to find food, water, shelter, and escape predators. This is what they have evolved to do over 55 millions years. When we keep horses confined in stables or in uninteresting paddocks, we prevent their body and mind from having the vital stimulation they need for good health. The body cannot function in the way it should, and the mind is subject to depression, boredom, and a constant level of underlying tension. Although we have never kept our horses stabled permanently, we did used to keep the horses which were in work in stables part of the time - either during the night or the day - on a regular basis. This routine was part of the structure we believed was convenient for us and beneficial for the horses. Now that they live out permanently, we see that it was totally unnecessary - in fact it was a lot more work for us, and didn't do the horses any good at all. We humans may feel comfortable and secure within the four walls of a house, but we shouldn't make the mistake of imposing this on an altogether different species, who's security lies in the ability to take flight from danger, and who's comfort and health are intimately linked with movement. We have always been lucky enough to have had access to a reasonable amount of land for our horses, both when we lived in Scotland, and here in France. Our way of making use of it, however, changed dramatically when we discovered the Paddock Paradise concept. Instead of the traditional idea of dividing the land into fields, a Paddock Paradise is a network of relatively narrow passages, or 'lanes', usually following the perimeter of the available land so as to maximize the distance, but potentially as complex as the terrain (and the imagination) allows. This idea, sparked by barefoot expert Jaime Jackson, came about as a result of his study of wild horse behavior, as a way of providing an environment for domesticated horses that stimulates them as closely as possible to the way the wild horse environment does. Channeling horses down pathways encourages them to move and explore much more than an open field does, and makes less grass available to them (to the benefit of their feet) favoring browsing and exploring instead. It also imposes the herd hierarchy on them more, reinforcing its structure and stability. 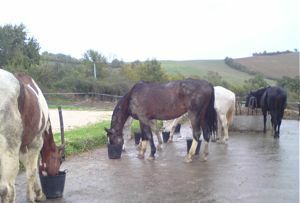 Strategic positioning of the water and feeding stations requires horses to move around, encouraging them to be more independent and exploratory. Our terrain here in France is ideal for an extensive, complex and interesting Paddock Paradise, which travels up and down steep hills, includes wooded areas, and leaves the inner fields available when we need them. Each of the two herds has their own facility for feeding, hay and shelter. Rafael's band have access to the overhang of our hay barn for shelter, where they come to eat their hay and get fed. 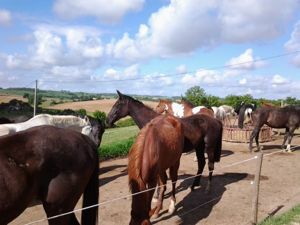 For our big herd, of 14 horses, we had a tarmac (asphalt) area made last spring, with three big bale feeders so that they have somewhere to eat out of the mud, which, with our clay soil, had previously been a big problem for us in the winter. Our Christmas present to the main herd was a large poly-tunnel which will provide them with free access to shelter when they need it, so we will no longer have to bring them into the stables, even temporarily, in extreme weather, and they will have shade in the summer. 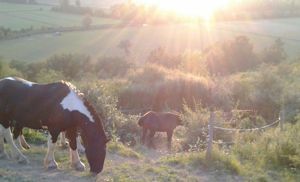 Along with the herd, the freedom and stimulation of living permanently in a interesting, non-restrictive environment is one of the most precious gifts we can give our horses, because this is what makes up their lives, day-in, day-out, and prevents the miserable and depressing monotony of confinement. See more about this on our Paddock Paradise page. 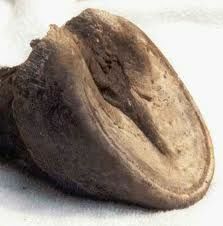 The hooves are an essential part of a horse's overall health, and whatever controversy still goes on over barefoot vs. shoeing, for us there is no question that shoeing is profoundly damaging to horses, and only a barefoot hoof can function the way it meant to, as it has evolved over millions of years to function. Little did we know that when we lost our farrier, around 15 years ago now, it was the first step to another one of the most important gifts we have given to our horses: healthy hooves from the inside-out. This was only the beginning of a long journey, because it wasn't until we eventually learned the right barefoot trimming method, and put together the other factors which influence hoof health - such as lifestyle, diet, and comfort (from the protection of hoof-boots), along with a good dose of patience - that our horses started to develop really healthy, strong and efficient feet. Some of our horses have shoe damage that they are unlikely to ever completely recover from within their lifetime, but at least we have given them the chance to get back significant healthy functioning, and to be able to feel their feet again, allowing them to connect to the ground in the way all horses should. This is yet another area of horse care where tradition leads us away from what is healthy and natural for horses. Although we had never been fans of feeding large quantities of grain, it was only through going barefoot that we learned about the damaging effects of a high-sugar diet for the horse. Horses have evolved to get most of the nutrition they need from forage of a low nutritional value, hence their incredibly long and efficient gut, able to digest fibre and extract the maximum nutrients from a steady flow of rough grazing. The problem with the grazing we offer most domestic horses is that it is far too rich in sugar for what the horse needs, and upsets the balance of the gut flora, resulting in toxins in the blood supply that in turn damage the delicate laminar tissue of the feet. This can manifest as acute laminitis, but takes place more commonly at a chronic, low level, resulting, nonetheless, in distortion of the hoof capsule, and degradation of the internal structures. Although we didn't feed a lot of grain in Scotland, the grass there was very sugar-rich, and did damage to our horses' feet that we were unaware of at the time, and which took them years to recover from. 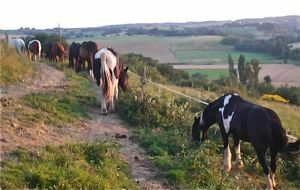 The grass is not so rich where we are in South-West France, but our Paddock Paradise has still played an important role in reducing the grass intake of out horses - especially when it grows very quickly in the springtime. Of course, the ideal substitute for grass is hay, and this is what should make up the bulk of a horse's diet. To make sure horses eat it in a slow, steady trickle (the healthiest way for their gut) slow-feeder nets, which have very small holes, are the ideal solution. 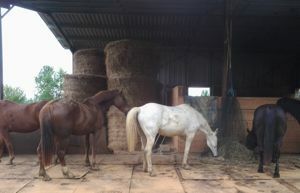 Because we have a large number of horses, we use big round bales in feeders, with slow feeder nets that cover the bale. This allows us to let the horses eat hay continuously for long periods - during the whole day or the night in winter, and the rest of the time they have the choice to graze and browse on the lanes. When we first became aware of the possible damaging effects on horses feet of feeding grain, we followed the advice of a barefoot trimmer, which was to dramatically reduce the amount of grain we fed the horses daily to a very minimal amount. However, we found that many of our horses lost too much condition as a result, and we have since found an optimal balance which suits each horse. We do have to recognize that we have changed horses' requirements to some degree through selective breeding, and a thoroughbred type does require a higher value diet than a native pony. Over the years, as we have gained experience and understanding of how the body's own healing mechanism functions, we have moved further and further away from the conventional approach to horse health care. The veterinary (medical) approach is fundamentally different from alternative approaches which support the horse's own intrinsic healing system, because it is principally about combating symptoms with synthetic drugs, instead of addressing the source of problems at a profound, energetic level. For this reason, we do not use vaccinations, synthetic wormers, or any other kind of pharmaceutical medicament. Not only do these substances not support the body's own healing mechanism, they positively compromise it. 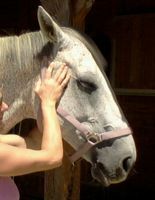 This philosophy of healing has been greatly informed by Cranio-Sacral Therapy, an energy/fascia therapy which Camille has practiced for more than 15 years, successfully resolving the vast majority of problem we have encountered with horses, from illness, colic and wounds to musculo-skeletal problems. When healing is approached on an energetic level, the barriers between emotions, life (and past life) experience, and the physical expression of energetic states break down, and problems can be addressed on a profoundly holistic level. At the same time, everything about the holistic lifestyle of our horses promotes health, and avoids many common problems that horses with an artificial lifestyle encounter. 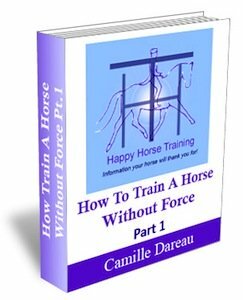 Healing can also be supported by the training process, and by finding ways to release issues and trauma (see Horse Trauma and how to Heal It). It is also facilitated simply by the way we are with horses whenever we are with them: being open, listening and, above all, being present with them. Supporting each horse's healing process on whatever level they need is one of the most profound gifts we can offer them. Read more about our philosophy of healing here. Allowing our horses' thermoregulation to function the way it should is one of the most recent things we have offered them, because this is the first winter we haven't used any form of rugs. Until recently, we were under the illusion that we were helping to protect our horses from cold and wet weather conditions by rugging them, but now we have realized that in fact rugs interfere with their natural systems of managing body heat, throwing them out of balance. Certain requirements go along with this, such as plenty of hay (horses generate heat by digesting fibre), good nutrition to supplement those horses who need it, and some form of shelter. We have been amazed at how well even the most sensitive thoroughbred types have coped with cold, wet weather, but of course this is just another area where we humans so commonly impose our own needs and values onto horses, without seeing that we are doing more harm than good. Last month's newsletter gives more details of our move to rugless: The Whole Horse no. 32: Going Rugless. Although they are much less visible, horses teeth are just like their feet - they grow constantly (to be more precise, the teeth erupt rather than grow) and they therefore depend on good wear to stay in balance. Just like with hooves, we need to help our domestic horses to maintain this balance in their teeth because their physiology and lifestyle do not always make it possible naturally, and moreover, asking horses to perform places much more importance on their mouth being comfortable and balanced. We have been aware of the importance of regular equine dentistry for a long time, but it was only this year that, thanks to our dentist Dan Astle-Carter, we added a major missing link to the picture - the importance of balancing the incisors. 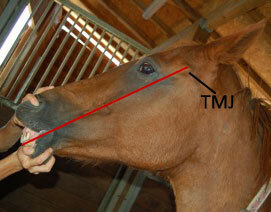 This is an area that is commonly neglected by many dentists (certainly those trained in the UK), but it has major consequences for the horse's whole body, because long or slanted incisors mean strain on the tempero-mandibular joint (where the jaw joins with the skull) and this can have many repercussions on the horse's body - especially concerning straightness in training, and the ability to soften the jaw as required by postural engagement. Our horses had their incisors corrected last summer, and the positive effects manifested markedly in their work before the winter break. Once we have succeeded in giving a horse everything they need for their essential health, stimulation and happiness, why not do something together? What could be better than a physical connection that allows both of us to transcend our body's normal limitations? Of course, most people don't come to riding and training horses from this point of view, and we didn't either. For us, riding was our first inspiration for having horses, and it was partly as a result of our desire to do it as well as possible that we were eventually led to discover all the ways we needed to change how we kept our horses to give a healthy and happy basis for training. 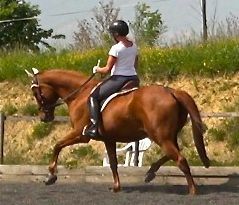 This is because dressage training (or any other form of training) that is gymnastically pure - i.e. 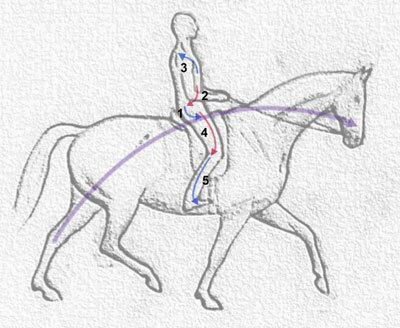 that demands a profound physical transformation which allows horse and rider to move together in unrestrained balance - relies on the horse being profoundly relaxed, on both a physical and emotional level, so that he/she is happy to give over their body to a way of balancing that is quite different from his natural reflexes, and demands a great trust in the human partner. 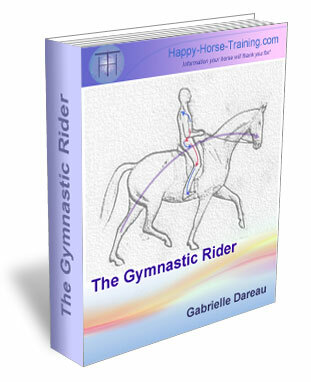 Discovering what the rider needs to accomplish in their own body in order to ride a horse in true balance has been a long journey in itself, accompanying the holistic one, but the resulting understanding is a marvelous gift to horses. It allows them not only to carry us without encumbrance or discomfort, but to feel a power and purity in their movement that they would not achieve naturally, because we can help them to gradually straighten their natural unevenness, and, with our own body, show them a different way of carrying themselves in movement, without restraint.